Have you ever thought of the ways garage doors affect your life? And since most of them move automatically thanks to the opener, we mainly talk about electric garage doors. The truth is that we never think about it because we only bother to open or close our overhead door. Or get bothered when it breaks down and we’ve got to have it fixed. But if you take a moment, you will realize the multiple roles of garage doors in your life. And then and only then, you will also recognize the value of keeping them in good shape. Let’s see why. We often talk about garage door safety merely because they’ve been too many accidents before. Here’s the trick. Garage doors do not offer safety. Quite the contrary, we seek protection from their heavy load. And here’s where the electric garage door openers came to fill the blank. With their photo eyes, reverse system, and release cord, contemporary openers provide safety. And so, assuming that your automatic garage door is properly serviced and installed, it will be safe. 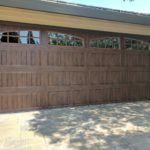 Why did residential garage doors become a necessity in the first place? To protect the car and eventually safeguard the property and all valuables we keep in the garage. Now, the funny thing is that we hardly talk about garage door security although it’s the main reason why we install garage doors in the first place. Once again, electric openers improved things. Today, they may come with several features that further increase security. Okay, we can all agree that manually operated garage doors were not very convenient. And then the opener came into the picture to change things. You push the garage door remote and drive in or out. And although the opener technology improved things to the maximum, let’s be fair here. Garage door designs have improved too. Overhead garage doors hardly occupy any space. Roll up doors occupy even less space – no wonder that they are perfect for small spaces. Back to the openers! Today, they have become smart. You can use the smartphone to open the garage door. You can check who comes in and whether or not the overhead door is closed by using your laptop. Can it get more convenient? Nowadays, the designs are endless. Whether you like a black or white raised panel garage door, you have options. If you like the convenience of overhead doors but adore the style of carriage doors, get a hybrid: a carriage house garage door. The materials are plenty too – vinyl, wood, steel, aluminum, composite, and glass garage doors. Whether you like them wind load rated or insulated, it won’t diminish their beauty. And there are so many colors, styles, and designs that everyone can find a perfect match for their home style. Simply put, you can easily improve the curb appeal of your home. 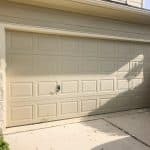 Why do garage doors affect the curb appeal? Because they usually feature in the front yard and let’s face it, they take a lot of space. They will either make or break the appearance of your home exterior. Assuming that garage doors are maintained in excellent condition, they can increase the home value. It’s no wonder that many homeowners opt for a garage door replacement before they sell their house. If buyers get a home with a garage, they want to get a good door too. And truth be told, with so many benefits, who wouldn’t pay a price for a home with a beautiful and sturdy garage door? And this brings us to the overall intention of this article. Garage doors play a major role in our lives. They let us in and out with safety and no hassle while they complement our property and increase home security. Who doesn’t want them? Just a kind reminder: you get the benefits when garage doors are installed right and their problems are fixed correctly. Don’t ignore these things and you’ll be happy.